Since 2012, faculty from across the university have connected their courses to Carolina Performing Arts artists through Arts@TheCore. In the 2016-2017 season, 89 courses from 21 different areas of study integrated CPA performances into their curricula, and our artists engaged in 32 class visits throughout the year. Below, read what faculty are saying and see two assignments from the 2016-17 season. You can get in touch with us any time at artsatthecore@unc.edu. 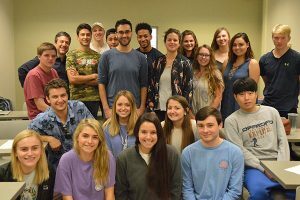 Tom Linden, the director of UNC’s Medical and Science Journalism Master’s Program, has worked with CPA artists many times. 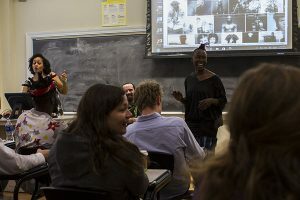 His students in Audio Journalism classes have interviewed visiting artists including Brooklyn Rider and the cast of Antigone and crafted reports on the artists. 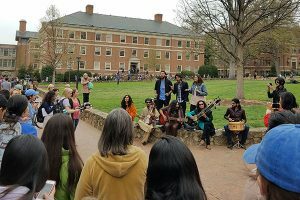 In 2017, Tom’s students interviewed the Pakistani ensemble Sounds of Kolachi, and recorded sound at their dress rehearsal and other events on campus. Below are a few of the students’ final products. “This assignment through CPA was the most successful of any performing arts-related assignments I have ever taught at Carolina, and so I’m quite excited to do something in a similar vein during both the fall and spring semesters of the 2017-2018 season.” – Marc Cohen, English Department, describing his success in incorporating Martha Graham Dance Company’s 2017 performance into his Composition and Rhetoric course. Contact artsatthecore@unc.edu to learn more, schedule a meeting, or reserve tickets for your class today!